As predicted, I've spent the last two weeks acquiring yarn for the designers of the Fall issue of Cast On. Of all of the things I now do for the magazine, this is the one that has surprised me the most. It takes so much time! I'm still waiting to hear from two companies. Since TNNA is just a few weeks away I think they may be preparing for it. Since they've added Cash and Carry to the event, many companies haul a lot of yarn to Columbus. I didn't get that many lessons to review but I did get my first MiniCourse lesson. I don't teach many but I did develop one last January for knitting Fair Isle Flat. I only developed this class to answer the questions I get about how to do it since it is my preference. More about that under Current Projects. I put grafting in pattern in that same category since it always results in a half stitch offset which just drives me crazy. I've learned to get over this as well. I was working on an infinity scarf for a birthday gift that required grafting in pattern and I stumbled across a video that had the clearest and simplest description of grafting I'd ever encountered. Jodie Gordon Lucas has a video in her website which I think will click for many knitters. (QueenieKnits). It covers any combination of stitches you might encounter (except for K1P1 ribbing or garter which are special cases). Most Kitchener instructions begin with positioning the stitches to be grafted on two needles, one in front of the other with the wrong sides together. Jodie's explanation is to look at the stitches as pairs. If they are the same type of stitch (two knits or two purls), you go into the first stitch in the same direction as the type of stitch (knitwise into a knit stitch), then you go into the second stitch in the opposite direction. 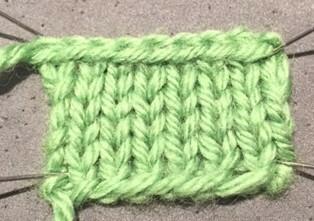 If the two stitches are different, a knit followed by a purl) you go into the the stitches in the same direction and the first stitch determines that direction. Now for the disclaimers about grafting in pattern. 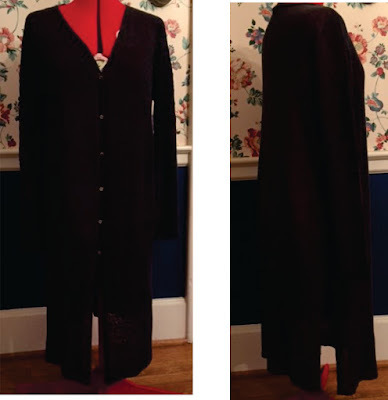 I can't say I've done a ton of research on the topic but most do not mention at all the half stitch offset. TECHknitter is the exception. Just how big of a deal is this? 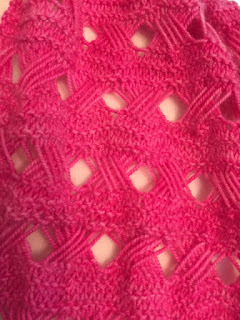 Well, most of the time you are grafting in pattern you are working with some sort of cable pattern or ribbing. The good news is that the texture of cables and ribbing tend to hide those nasty offsets. If you look at the photos below you can see that the offset isn't visible in the first. You only see it in the second if it is stretched. In an actual project it is barely noticeable. 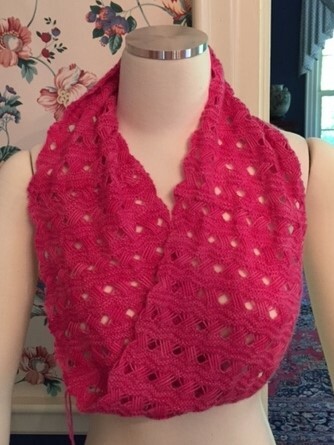 Here is a photo of the infinity scarf I knit. I haven't woven in the ends yet. Do you see the offset? Here is a closeup of the area I grafted. Can you spot the offset here? I've just decided this doesn't bother me. As I said above, two stitch patterns which require special handling in grafting are K1P1 ribbing and garter. I'll do a video in my next entry on K1P1 ribbing. Salon will be on Saturday for a change. The time will be 1:30 to 3:30. Hope you can make it. 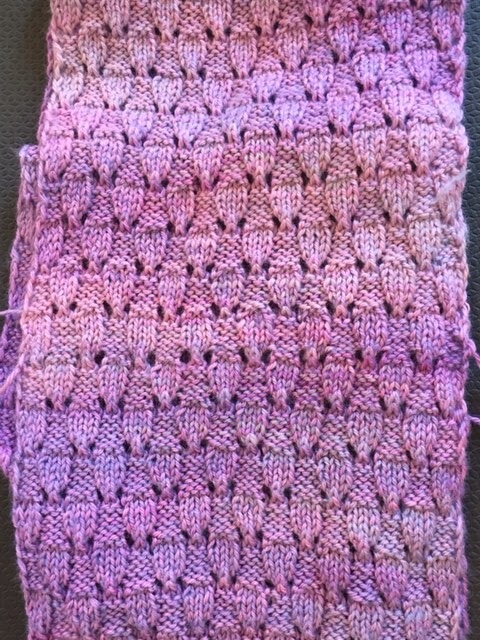 I love this stitch pattern. I'm finally getting a start on my project for Cast On. I'm using RedFish 3 ply and size 2.25mm needles. This is the bottom border. Beehives are above the bees. 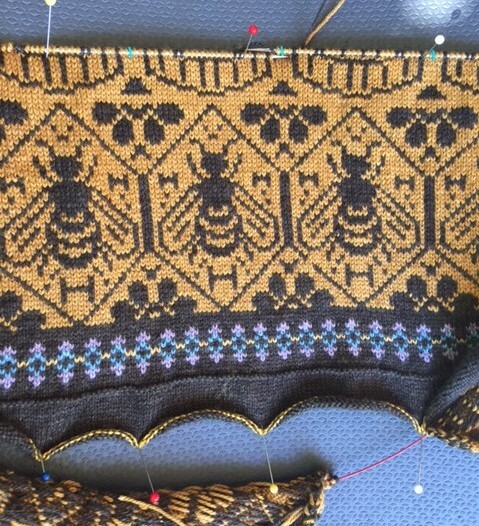 The colors will reverse for the top part of the sweater and the bee design will change. The honeycombs will interlock. The photograph doesn't do the colors justice. I'm knitting this flat as I find it easier to maintain good tension on the floats. I'm a week late making posting but it has been a busy couple of weeks. Getting the magazine out is really a lot of work. It was released on May 11. The due date for Fall proposals was the 10th so it all starts again today. We've selected the designs so I'll spend next week working to get the yarn to the designs and sending out contracts. We are back on schedule after the reorganization so Winter should be easier! Lessons are arriving more regularly which makes me happy. 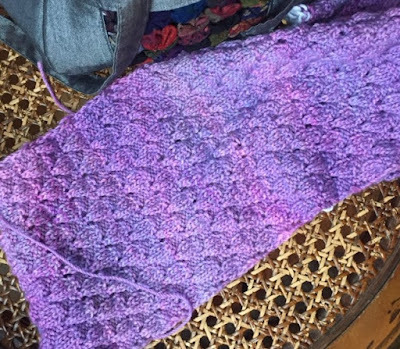 Reviewing knitting is a break from the publishing work. Keep up the good work. I've discussed this topic before but I have more insight on the topic due to some research done by a former Co-Chair of the Masters Committee. Suzanne Bryan is the most analytical knitter I know. She did a very thorough discussion of the topic in her blog. My tip is the shorthand version. Salon will be on Sunday. Yes, I know it is Mother's Day but the final Metropolitan Opera is tomorrow. It is my favorite opera...Der Rosenkavalier by Richard Strauss. It will be a blissful 4 hours and 40 minutes. I'll be doing the Fashion Framework Lesson for fall. It will be on texting gloves. I'm also doing a stranded sweater with RedFish yarns. It will be a bee motif. I can't leave the bee chart alone. I've redone it about 10 times. Hopefully each redo is an improvement! I haven't got any of the yarns yet so I've got time to finish up some things. This extremely boring garment is for me. It is made with Shibui Linen in my favorite color. 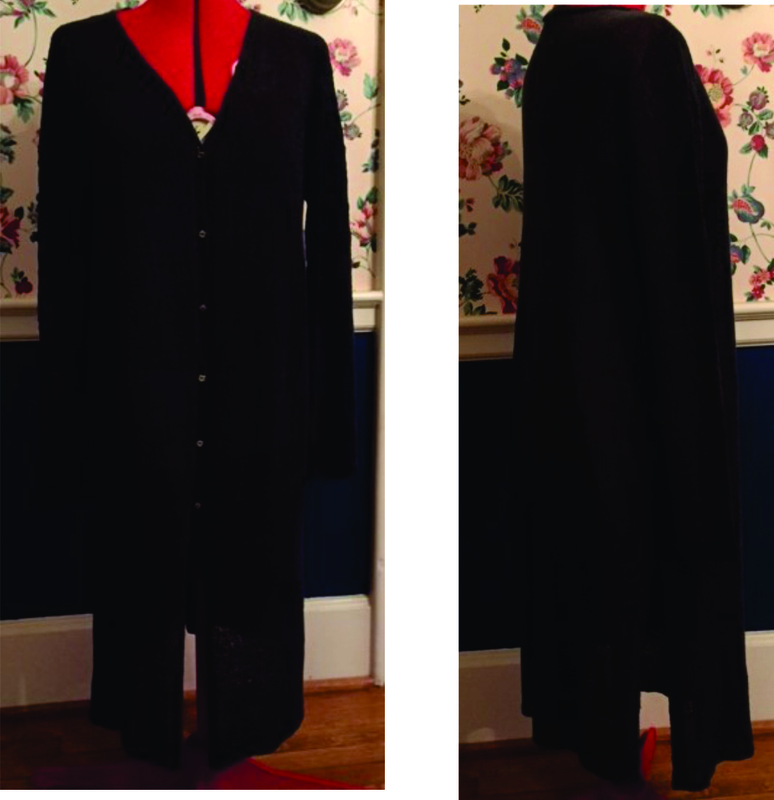 It is replacing a sweater coat I've had for close to 15 years which is looking just a bit ratty. This is a birthday present for a friend whose birthday was in March. Yes, I am that far behind. It will be an infinity scarf. The yarn is Anzula Luster, color Iris...heaven to work with.